After the news that Sky had acquired the UK rights to air all of HBO‘s content (minus any existing deals), we’ve been waiting to hear what they planned to do with all their new toys. We finally have the answer with the announcement of a new channel, Sky Atlantic, launching in early 2011. Thankfully, Sky Atlantic will not (as may feared) be an extra premium channel, but will come as part of the standard Variety Pack, along with is sister channel, Sky Atlantic HD. 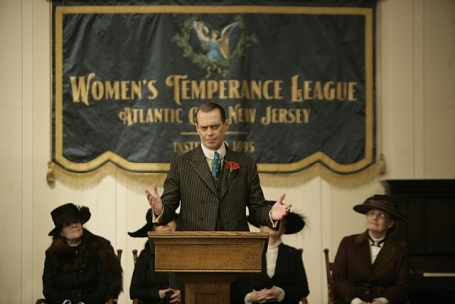 Programming will include the UK premiere of HBO’s Boardwalk Empire in Feb 2011, along with a raft of other HBO shows, including Dustin Hoffman’s Luck, Mildred Pierce starring Kate Winslet (UK air date March 2011), Game Of Thrones and Treme, both airing in April 2011. Also coming to the channel will be new series of HBO’s Entourage and Big Love, as well as re-runs of HBO’s back catalogue of critically acclaimed show like The Sopranos, The Wire, Six Feet Under and Steven Spielberg’s The Pacific. So yes, once again, Freeview people lose out, but if your a Sky subscriber, you’ve just had an awesome new channel added to your line up for free! Roll on 2011, I think i may just have a favourite new TV channel! ← Chuck Moving to Living TV? Do you have an Air Date For the Movie “Temple Grandin” due to be shown on Sky Atlantic?